tat—those; naù—unto us; çuçrüñamäëänäm—those who are endeavoring for; arhasi—ought to do it; aìga—O Süta Gosvämé; anuvarëitum—to explain by following in the footsteps of previous äcäryas; yasya—whose; avatäraù—incarnation; bhütänäm—of the living beings; kñemäya—for good; ca—and; bhaväya—upliftment; ca—and. Enlighten us, O Süta, about the Personality of Godhead and His incarnations. We are eager to learn those teachings imparted by previous masters [äcäryas], for one is uplifted by hearing them. The conditions for hearing the transcendental message of the Absolute Truth are set forth herein. The first condition is that the audience must be very sincere and eager to hear. And the speaker must be in the line of disciplic succession from the recognized äcärya. The transcendental message of the Absolute is not understandable by those who are materially absorbed. Under the direction of a bona fide spiritual master, one becomes gradually purified. Therefore, one must be in the chain of disciplic succession and learn the spiritual art by submissive hearing. In the case of Süta Gosvämé and the sages of Naimiñäraëya, all these conditions are fulfilled because Çréla Süta Gosvämé is in the line of Çréla Vyäsadeva, and the sages of Naimiñäraëya are all sincere souls who are anxious to learn the truth. Thus the transcendental topics of Lord Çré Kåñëa’s superhuman activities, His incarnation, His birth, appearance or disappearance, His forms, His names and so on are all easily understandable because all requirements are fulfilled. Such discourses help all men on the path of spiritual realization. äpannaù—being entangled; saàsåtim—in the hurdle of birth and death; ghoräm—too complicated; yat—what; näma—the absolute name; vivaçaù—unconsciously; gåëan—chanting; tataù—from that; sadyaù—at once; vimucyeta—gets freedom; yat—that which; bibheti—fears; svayam—personally; bhayam-fear itself. Living beings who are entangled in the meshes of birth and death can be freed immediately by even unconsciously chanting the holy name of Kåñëa, which is feared by fear personified. Väsudeva or Lord Kåñëa, the Absolute Personality of Godhead, is the supreme controller of everything. There is no one in creation who is not afraid of the rage of the Almighty. Great asuras like Rävaëa, Hiraëyakaçipu, Kaàsa, and others who were very powerful living entities were all killed by the Personality of Godhead. And the almighty Väsudeva has empowered His name with the powers of His personal Self. Everything is related to Him, and everything has its identity in Him. It is stated herein that the name of Kåñëa is feared even by fear personified. This indicates that the name of Kåñëa is nondifferent from Kåñëa. Therefore, the name of Kåñëa is as powerful as Lord Kåñëa Himself. There is no difference at all. Anyone, therefore, can take advantage of the holy names of Lord Çré Kåñëa even in the midst of greatest dangers. The transcendental name of Kåñëa, even though uttered unconsciously or by force of circumstances, can help one obtain freedom from the hurdle of birth and death. yat—whose; päda—lotus feet; saàçrayäù—those who have taken shelter of; süta—O Süta Gosvämé; munayaù—great sages; praçamäyanäù—absorbed in devotion to the Supreme; sadyaù—at once; punanti—sanctify; upaspåñöäù—simply by association; svar-dhunya—of the sacred Ganges; apaù—water; anusevayä—bringing into use. O Süta, those great sages who have completely taken shelter of the lotus feet of the Lord can at once sanctify those who come in touch with them, whereas the waters of the Ganges can sanctify only after prolonged use. Pure devotees of the Lord are more powerful than the waters of the sacred river Ganges. One can derive spiritual benefit out of prolonged use of the Ganges waters. But one can be sanctified at once by the mercy of a pure devotee of the Lord. In Bhagavad-gétä it is said that any person, regardless of birth as çüdra, woman, or merchant, can take shelter of the lotus feet of the Lord and by so doing can return to Godhead. To take shelter of the lotus feet of the Lord means to take shelter of the pure devotees. The pure devotees whose only business is serving are honored by the names Prabhupäda and Viñëupäda, which indicate such devotees to be representatives of the lotus feet of the Lord. Anyone, therefore, who takes shelter of the lotus feet of a pure devotee by accepting the pure devotee as his spiritual master can be at once purified. Such devotees of the Lord are honored equally with the Lord because they are engaged in the most confidential service of the Lord, for they deliver out of the material world the fallen souls whom the Lord wants to return home, back to Godhead. Such pure devotees are better known as vice-lords according to revealed scriptures. The sincere disciple of the pure devotee considers the spiritual master equal to the Lord, but always considers himself to be a humble servant of the servant of the Lord. This is the pure devotional path. kaù—who; vä—rather; bhagavataù—of the Lord; tasya—his; puëya—virtuous; çlokeòya—worshipable by prayers; karmaëaù—deeds; çuddhi-kämaù—desiring deliverance from all sins; na—not; çåëuyät—does hear; yaçaù—glories; kali—of the age of quarrel; maläpaham—the agent for sanctification. Who is there, desiring deliverance from the vices of the Age of Kali, who is not willing to hear the glories of the Lord? The Age of Kali is the most condemned age due to its quarrelsome features. Kali-yuga is so saturated with vicious habits that there is a great fight at the slightest misunderstanding. Those who are engaged in the pure devotional service of the Lord, who are without any desire for self-aggrandizement and who are freed from the effects of fruitive actions and dry philosophical speculations are capable of getting out of the estrangements of this complicated age. The leaders of the people are very much anxious to live in peace and friendship, but they have no information of the simple method of hearing the glories of the Lord. On the contrary, such leaders are opposed to the propagation of the glories of the Lord. In other words, the foolish leaders want to completely deny the existence of the Lord. In the name of secular state, such leaders are enacting various plans every year. But by the insurmountable intricacies of the material nature of the Lord, all these plans for progress are being constantly frustrated. They have no eyes to see that their attempts at peace and friendship are failing. But here is the hint to get over the hurdle. If we want actual peace, we must open the road to understand the Supreme Lord Kåñëa and glorify Him for His virtuous activities as they are depicted in the pages of the Çrémad-Bhägavatam. tasya—His; karmäëi—transcendental acts; udäräëi—magnanimous; parigétäni—broadcast; süribhiù—by the great souls; brühi—please speak; naù—unto us; çraddadhänänäà—ready to receive with respect; lélayä—pastimes; dadhataù—advented; kaläù—incarnations. His transcendental acts are magnificent and gracious, and great learned sages like Närada sing of them. Please, therefore, speak to us, who are eager to hear about His adventures which He performs in His various incarnations. The Personality of Godhead is never inactive as some less intelligent persons suggest. His works are magnificent and magnanimous. His creations both material and spiritual are all wonderful and contain all variegatedness. They are described nicely by such liberated souls as Çréla Närada, Vyäsa, Välméki, Devala, Asita, Madhva, Çré Caitanya, Rämänuja, Viñëusvämé, Nimbärka, Çrédhara, Viçvanätha, Baladeva, Bhaktivinode, Siddhänta Sarasvaté and many other learned and self-realized souls. These creations, both material and spiritual, are full of opulence, beauty, and knowledge, but the spiritual realm is more magnificent due to its being full of knowledge, bliss and eternity. The material creations are manifested for some time as perverted shadows of the spiritual kingdom and can be likened to cinemas. They attract people of less intelligent caliber who are attracted by false things. Such foolish men have no information of the reality, and they take it for granted that the false material manifestation is the all in all. But more intelligent men guided by sages like Vyäsa and Närada know that the eternal kingdom of God is more delightful, larger, and eternally full of bliss and knowledge. Those who are not conversant with the activities of the Lord and His transcendental realm are sometimes favored by the Lord in His adventures as incarnations wherein He displays the eternal bliss of His association in the transcendental realm. By such activities He attracts the conditioned souls of the material world. Some of these conditioned souls are engaged in the false enjoyment of material senses and others in simply negating their real life in the spiritual world. These less intelligent persons are known as karmés or fruitive workers, and the others are known as jïänés or dry mental speculators. But above these two classes of men is the transcendentalist known as sätvata or the devotee who is neither busy with rampant material activity nor with material speculation. He is engaged in the positive service of the Lord, and thereby he derives the highest spiritual benefit unknown to the karmés and jïänés. As the supreme controller of both the material and spiritual worlds, the Lord has different incarnations of unlimited categories. Incarnations like Brahmä, Rudra, Manu, Påthu, Vyäsa and so on are His material qualitative incarnations, but His incarnations like Räma, Narasiàha, Varäha, Vämana, and so on are His transcendental incarnations. Lord Çré Kåñëa is the fountainhead of all incarnations, and He is therefore the cause of all causes. atha—therefore; äkhyähi—describe; hareù—of the Lord; dhéman—O sagacious one; avatära—incarnations; kathäù—narratives; çubhäù—auspicious; lélä—adventures; vidadhataù—performed; svairam—pastimes; éçvarasya—the supreme controller’s; ätmä—personal; mäyayä—energies. O wise Süta, please narrate to us the transcendental pastimes of the Supreme Godhead’s multi-incarnations. Such auspicious adventures and pastimes of the Lord are performed by His internal powers. For the creation, maintenance, and destruction of the material worlds, the Supreme Lord Personality of Godhead Himself appears in many thousands of forms of incarnations, and the specific adventures found in those transcendental forms are all auspicious. Both those who are present during such activities and those who hear the transcendental narrations of such activities are benefited. vayam—we; tu—but; na—not; vitåpyämaù—shall be at rest; uttama-çloka—the Personality of Godhead who is glorified by transcendental prayers; vikrame—adventures; yat—which; çåëvatäm—by continuous hearing; rasa-humor; jïänäm—those who are conversant with; svädu—relishing; svädu—palatable; pade pade—in every step. We never tire of hearing the transcendental pastimes of the Personality of Godhead who is glorified by hymns and prayers. Those who enjoy association with Him relish hearing of His pastimes at very moment. There is a great difference between mundane stories, fiction, or history and the transcendental pastimes of the Lord. The histories of the whole universe contain references to the pastimes of the incarnations of the Lord. 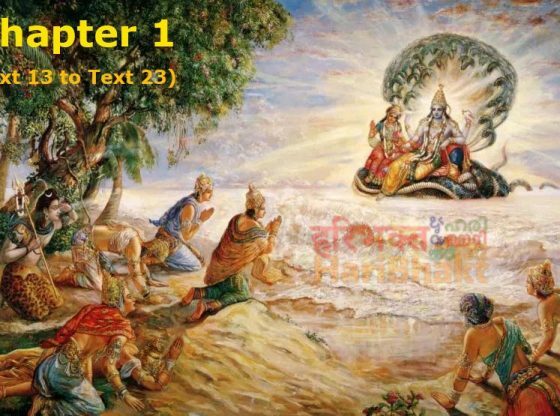 The Rämäyaëa, Mahäbhärata, and the Puräëas are histories of bygone ages recorded in connection with the pastimes of the incarnations of the Lord and therefore remain fresh even after repeated readings. For example, anyone may read Bhagavad-gétä or the Çrémad-Bhägavatam repeatedly throughout his whole life and yet find in them new light of information. Mundane news is static whereas transcendental news is dynamic, inasmuch as the spirit is dynamic and matter is static. Those who have developed a taste for understanding the transcendental subject matter are never tired of hearing such narrations. One is quickly satiated by mundane activities, but no one is satiated by transcendental or devotional activities. Uttama-çloka indicates that literature which is not meant for nescience. Mundane literature is in the mode of darkness or ignorance, whereas transcendental literature is quite different. Transcendental literature is above the mode of darkness, and its light becomes more luminous with progressive reading and realization of the transcendental subject matter. The so-called liberated persons are never satisfied by the repetition of the words ahaà brahmäsmi Such artificial realization of Brahman becomes hackneyed, and so to relish real pleasure they turn to the narrations of the Çrémad-Bhägavatam. Those who are not so fortunate turn to altruism and worldly philanthropy. This means the Mäyäväda philosophy is mundane, whereas the philosophy of Bhagavad-gétä and Çrémad-Bhägavatam is transcendental. kåtavän—done by; kila—what and what; karmäëi—acts; saha—along with; rämeëa—Balaräma; keçavaù—Çré Kåñëa; atimartyäni—superhuman; bhagavän—the Personality of Godhead; güòhaù—masked as; kapaöa—apparently; mänuñaù—human being. Lord Çré Kåñëa, the Personality of Godhead, and Balaräma played like human beings, and so masked They performed many superhuman acts. The doctrines of anthropomorphism or that of zoomorphism are never applicable to Çré Kåñëa or the Personality of Godhead. The theory that a man becomes God by dint of penance and austerities is very much rampant nowadays, especially in India. Since Lord Räma, Lord Kåñëa, and Lord Caitanya Mahäprabhu were detected by the sages and saints to be the Personality of Godhead as indicated in revealed scriptures, many unscrupulous men have created their own incarnations. This process of concocting an incarnation of God has become an ordinary business, especially in Bengal. Any popular personality with a few traits of mystic powers will display some feat of jugglery and easily become an incarnation of Godhead by popular vote. Lord Çré Kåñëa was not that type of incarnation. He was actually the Personality of Godhead from the very beginning of His appearance. He appeared before His so-called mother as four-armed Viñëu. Then at the request of the mother, He became like a human child and at once left her for another devotee at Gokula where He was accepted as the son of Nanda Mahäräja and Yaçodä Mätä. Similarly, Çré Baladeva, the counter part of Lord Çré Kåñëa, was also considered a human child born of another wife of Çré Vasudeva. In Bhagavad-gétä, the Lord says that His birth and deeds are transcendental and that anyone who is so fortunate as to know the transcendental nature of His birth and deeds will at once become liberated and eligible to return to the kingdom of God. So knowledge of the transcendental nature of the birth and deeds of Lord Çré Kåñëa is sufficient for liberation. In the Bhägavatam, the transcendental nature of the Lord is described in nine cantos, and in the Tenth Canto His specific pastimes are taken up. All this becomes known as one’s reading of this literature progresses. It is important to note here, however, that the Lord exhibited His divinity even from the lap of His mother, that His deeds are all superhuman (He lifted Govardhana Hill at the age of six), and that all these acts definitely prove Him to be actually the Supreme Personality of Godhead. Yet, due to His mystic covering, He was always accepted as an ordinary human child by His so-called father and mother and other relatives. Whenever some herculean task was performed by Him, the father and mother took it otherwise. And they remained satisfied with unflinching filial love for their son. As such, the sages of Naimiñäraëya describe Him as apparently resembling a human being, but actually He is the Supreme Almighty Personality of Godhead. kalim—the age of Kali (iron age of quarrel); ägatam—having arrived; äjïäya—knowing this; kñetre—in this tract of land; asmin—in this; vaiñëave—specially meant for the devotee of the Lord; vayam—we; äsénä—seated; dérgha—prolonged; satreëa—for performance of sacrifices; kathäyäm—in the words of; sakñaëä—with time at our disposal; hareù—of the Personality of Godhead. Knowing well that the Age of Kali has already begun, we are assembled here in this holy place to hear at great length the transcendental message of God and in this way perform sacrifice. This age of Kali is not at all suitable for self-realization as was Satya-yuga, the golden age, or Tretä or Dväpara yugas, the silver and copper ages. For self-realization, the people in Satya-yuga, living a lifetime of a hundred thousand years, were able to perform prolonged meditation. And in Tretä-yuga, when the duration of life was ten thousand years, self-realization was attained by performance of great sacrifice. And in the Dväpara-yuga when the duration of life was for one thousand years, self-realization was attained by worshipping the Lord. But in the Kali-yuga, the maximum duration of life being one hundred years only and that combined with various difficulties, the process of self-realization is recommended by hearing and chanting of the holy name, fame, and pastimes of the Lord. The sages of Naimiñäraëya began this process for the devotees of the Lord. So they prepared themselves to hear the pastimes of the Lord over a period of one thousand years. By the example of these sages one should learn that regular hearing and recitation of the Bhägavatam is the only way for self-realization. Other attempts are simply a waste of time, for they do not give any tangible results. Lord Çré Caitanya Mahäprabhu preached this system of Bhägavata-dharma, and He recommended that all those who were born in India should take the responsibility of broadcasting the messages of Lord Çré Kåñëa, primarily the message of Bhagavad-gétä. And when one is well established in the teachings of Bhagavad-gétä, he can take up the study of Çrémad-Bhägavatam for further enlightenment in self-realization. tvam—your goodness; naù—unto us; sandarçitaù—meeting; dhäträ—by providence; dustaram—insurmountable; nistitérñatäm—for those desiring to cross over; kalim—the age of Kali; sattva-haram—that which deteriorates the good qualities; puàsäm—of the man; karëa-dhäraù—captain; iva—as; arëavam—the ocean. We think that we have met Your Grace by the will of providence, and thus we accept you as captain of the ship for those who desire to cross the dangerous ocean of Kali, which destroys all the good qualities of a human being. The age of Kali is very dangerous for the human being. Human life is simply meant for self-realization, but due to this dangerous age, men have completely forgotten the aim of life. In this age, the life span will gradually decrease. People will gradually lose their memory, finer sentiments, strength, and better qualities. A list of the anomalies for this age is given in the Twelfth Canto of this work. And so this age is very difficult for those who want to utilize this life for self-realization. The people are so busy with sense gratification that they completely forget about self-realization. Out of madness they frankly say that there is no need for self-realization because they do not realize that this brief life is but a moment on our great journey towards self-realization. The whole system of education is geared to sense gratification, and if a learned man thinks it over, he sees that the children of this age are being intentionally sent to the slaughterhouses of so-called education. Learned men, therefore, must be cautious of this dangerous age, and if they at all want to cross over the dangerous ocean of Kali, they must follow the footsteps of the sages of Naimiñäraëya and accept Çré Süta Gosvämé or his bona fide representative as the captain of the ship. The ship is the message of Lord Çré Kåñëa in the shape of Bhagavad-gétä or the Çrémad-Bhägavatam. brühi—please tell; yoga-éçvare—the Lord of all mystic powers; kåñëe—Lord Kåñëa; brahmaëye—the Absolute Truth; dharma—religion; varmaëi—protector; sväm—own; käñöhäm—abode; adhunä—nowadays; upete—having gone away; dharmaù—religion; kam—unto whom; çaraëam—shelter; gataù—gone. Now that Çré Kåñëa, the Absolute Truth, the master of all mystic powers, has departed for His own abode, please tell us by whom religious principles are presently protected. Essentially religion is the prescribed codes enunciated by the Personality of Godhead Himself. Whenever there is gross misuse or neglect of the principles of religion, the Supreme Lord appears Himself to restore religious principles. This is stated in Bhagavad-gétä. Here the sages of Naimiñäraëya are inquiring about these principles. The reply to this question is given later. The Çrémad-Bhägavatam is the transcendental sound representation of the Personality of Godhead, and thus it is the full representation of transcendental knowledge and religious principles.